Unless you are a seasoned diver who has experienced your fair share of shark dives, you probably don’t realize that every shark offers a completely different experience. Sharks of any kind add a little something extra to the adrenaline rush and extreme sports enthusiasts will tell you that there really is nothing quite like diving right next to a shark. One shark that really offers a terrifying yet amazing dive experience are tiger sharks. Diving with tiger sharks means diving alongside one of the biggest macro predators the ocean has to offer. The tiger shark is often called the “tiger of the sea.” This is likely due to the patter across its back that resembles tiger stripes. The pattern fades as the shark matures, but is still easily visible. The most stunning thing about the tiger shark is its incredible size. While they tend to grow more slowly than others, they can grow to be up to 16 feet long and weigh as much as 1,400 pounds. Diving with tiger sharks is definitely a thrilling experience as far as extreme sports go; especially since the best time to see them is at night. Tiger sharks tend to keep to themselves during the day, but once it’s dark they come out of hiding. We should also mention that while seeing them at night is best, that’s also when they happen to be hunting. If the thought of that doesn’t get your heart racing, you may want to see a doctor! 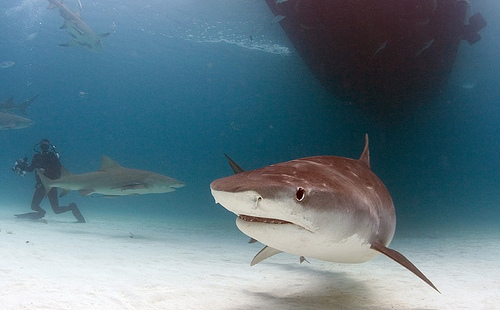 When it comes to the tiger shark’s diet, the general rule seems to be that if it’s smaller than them, they can eat it. Clearly that doesn’t narrow things down much considering how big they are, so suffice to say that tiger sharks will eat most anything; from fish and birds to seals, dolphins, and smaller sharks. The word “thrill” is much better suited for this extreme sports experience than “danger.” While diving with tiger sharks can be dangerous, it’s not nearly so much as Hollywood would have you think. There have only ever been about 120 shark attacks and about 30 of them were fatal. Also, of the more than 360 species of sharks, only 4 of them have ever been involved in attacks. The tiger shark comes in at number two after the great white shark. 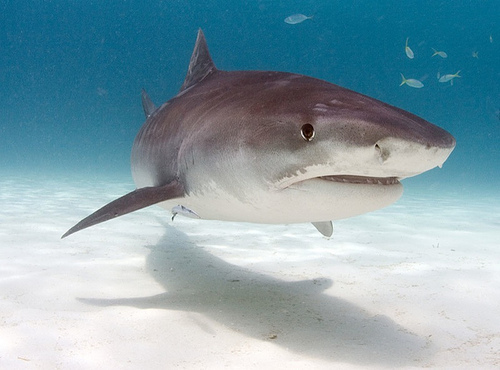 Tiger sharks don’t go looking for trouble, but they do manage to find their way into shallow water areas, estuaries, or harbors where contact with humans is inevitable. For being such a massive shark, the tiger shark has relatively few incidents of attacks, and rarely attacks unprovoked. There have not been many tiger sharks to make headlines, but one incident has become world famous. In 2003, surfer Bethany Hamilton lost her arm in a tiger shark attack. Soul Surfer was a movie created around that event and that may be one of the things that have led people to believe that tiger sharks are incredibly dangerous. Some extreme sports enthusiasts try cage diving and others attempt baited cage-less diving. Both offer an incredible rush and neither is for the faint of heart. Diving with tiger sharks even gets the most seasoned extreme sports lover’s adrenaline going so it’s best you do your research and be prepared before throwing yourself into the ocean alongside one. 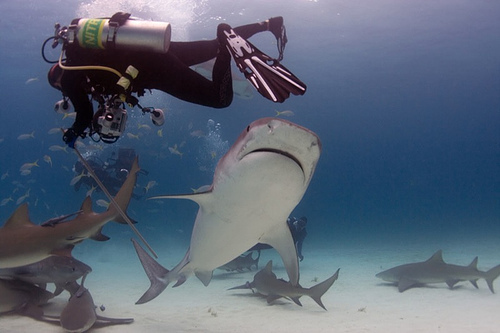 Aside from the thrill, diving with tiger sharks will have you seeing beautiful places and swimming in warm waters. Tiger sharks tend to like temperate and tropical waters and are commonly found around the islands of the central Pacific. Tiger sharks are slightly nomadic and tend to follow the warm current and stick close to the equator. If you are looking for a Pacific Ocean dive, some of the best places in each direction are Japan and New Zealand. North American beaches, South America, and the Gulf of Mexico have also seen their fair share of tiger sharks, and those who have taken up diving as an extreme sport hobby will certainly want to spend some time in the Caribbean. Africa also boasts some of the best experiences for diving with tiger sharks and has several established dive sites. Other great places include Hong Kong, India, and Australia. This entry was posted in Scuba Diving, Water Sports and tagged Tiger Sharks. Bookmark the permalink.